Ready for a swim in the ocean? Of course, you are. You just need to get yourself a set of fins! 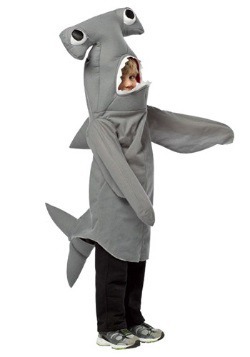 And the easiest way to do that is to get yourself into a shark costume. 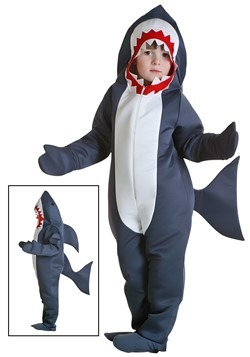 We have a fierce selection of shark costumes including exclusive, Made by Us designs. 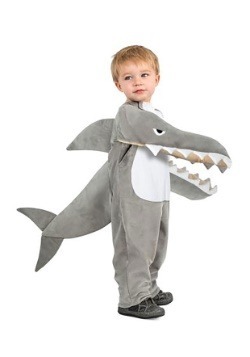 Pick out a costume with tall fins and sharp teeth, and we're sure you're going to be a ferocious ocean predator! A giant mass of cartilage, teeth and bad attitude, the shark holds the title of most fearsome predator of the seas. But why stop there? Just because the deadly fish features a body designed for aquatic hunting doesn't mean that it has to stay put in the world's oceans. 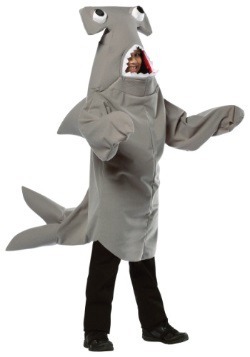 With one of our shark costumes, you can turn every galeophobe's worst nightmare into a reality! 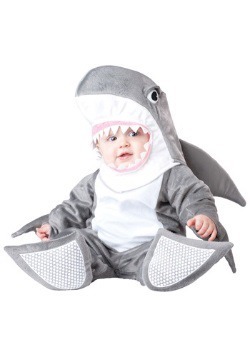 Our shark costumes range from adorable baby buntings, or those little fish in your life who haven't gotten their hunting teeth yet to adult costumes, to even an outfit for your puppy. 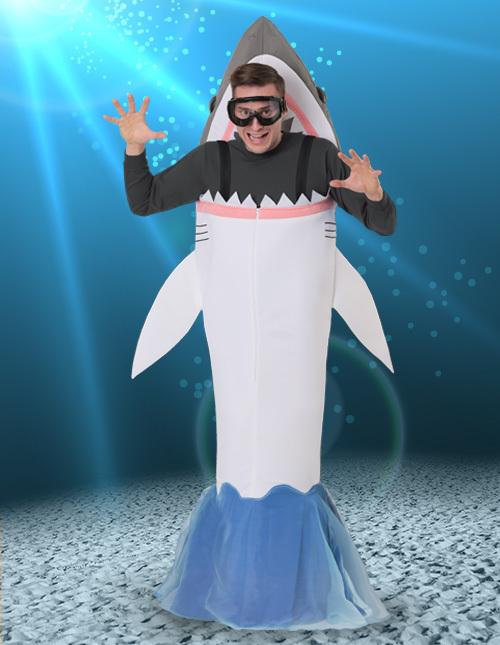 The one thing that all these costumes share is their unmatched ability to make the wearer feel like swimming through the water, attacking anything they feel like. And why not? Sharks do what they want. 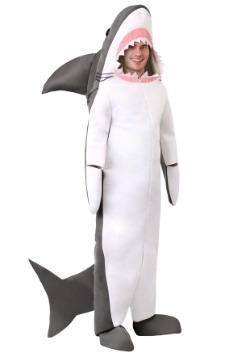 They're the king of the sea, just like you'll be king of the whatever-it-is-you-want-to-be-king-of in one of our shark costumes. 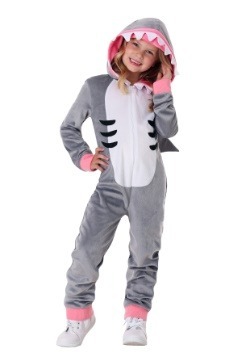 This year, swim around the neighborhood collecting candy in a shark Halloween costume! Everyone is fascinated by the ocean. It's the only place you can feel like a space explorer here on Earth. Really, it is the strange outer space that we can actually access here on Earth. Creatures dwelling in the water are a source of mystery, fear, and intrigue. Well, Halloween is all about exploring the things that we're a little freaked out about, so how can anyone resist exploring some oceanic options? 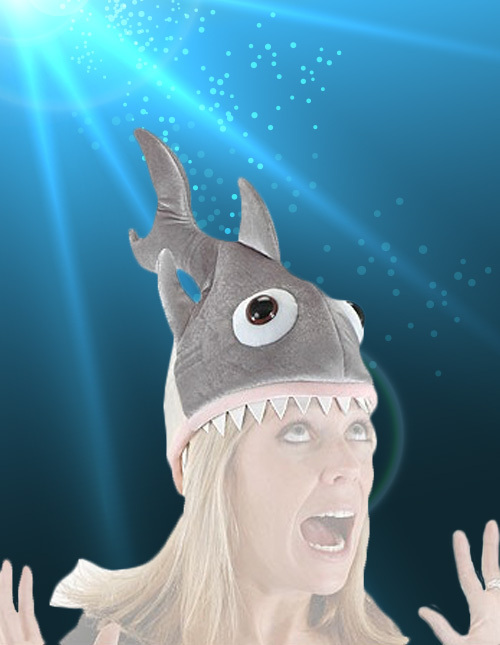 And, if you're diving in the deep end, you might as well become the ruler of the watery realm: the shark! 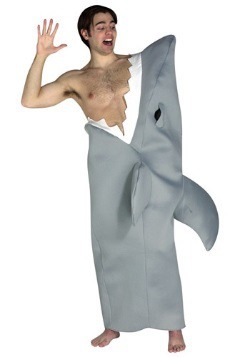 We already devote a whole week of media to the shark, so isn't it time to devote a costumed celebration to the king of the sea? 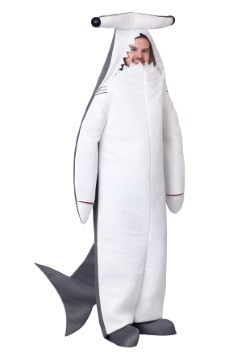 Whether you want to test the waters and rid yourself of some shark fear or pull a full-on Fonzie and jump the shark this year, we've got a proverbial Sharknado of selections for your choice of Halloween shark costumes. The first thing to keep in mind when you're flipping from legs to flippers is that breathing underwater is not really a skill that you can easily work on. So, start off just by getting your moves down. Sharks have to keep moving at all times or they run into some serious problems, so you'll need to get those fins in full fun mode! Since you're likely sticking to land shark mode, there are plenty of options for your fish folk needs. 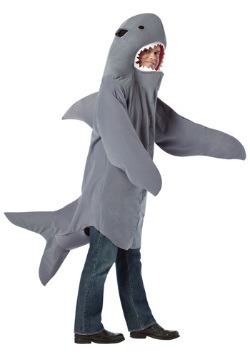 Are you a dancing shark kind of bloke or are you more into that slow stalk that the great white shark is known for? 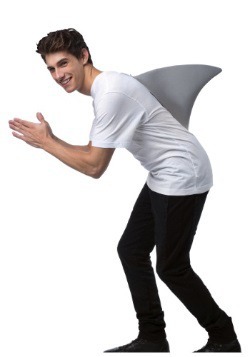 Perhaps you just need to get your fins on some of our shark Halloween costumes and invent a persona that's completely new! Picture this: it is 2015 and the Superbowl has all the fans leaping to their feet for Katy Perry to let loose with the latest rendition of Teenage Dream and California Gurls. 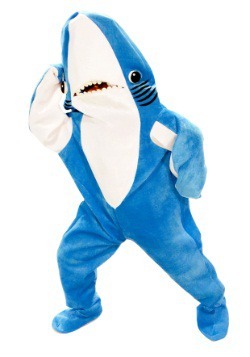 It takes something special to steal the stage from a pop star, and stage right has the right shark for the job! 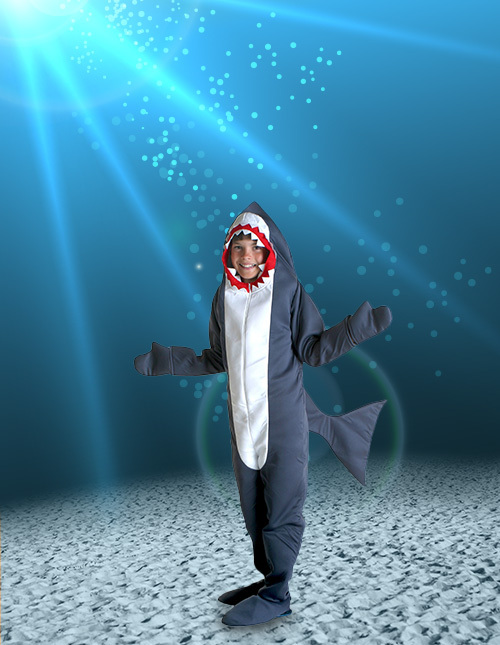 Now you can swim right into the role of the great white shark of Internet fame, Left Shark! Think that your dance moves are a little lacking? Well, fear not! 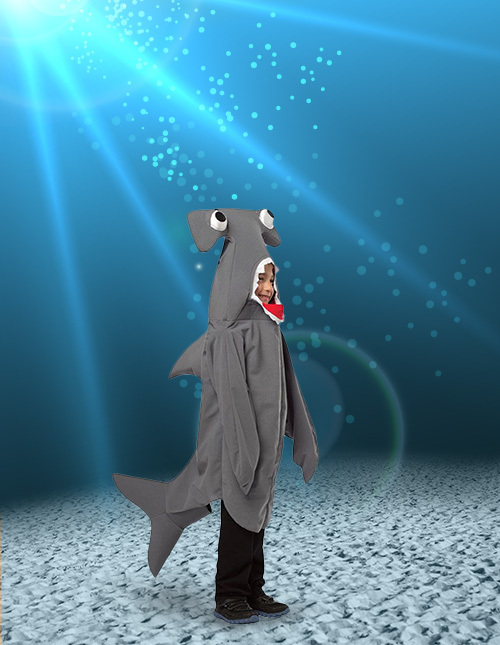 It turns out that the scene-stealing sensation was improvising everything, so all you'll need to do is have fun in order to be a completely authentic shark performer in a Katy Perry Left Shark Costume! It is tough to try to find a perfect balance in life between comfort, productivity, and some serious nap time. There is always someone who thinks you should be doing something else. Of course, there are ways to both nap comfortably and keep folks from daring to judge! And, better yet, you can still be ready for a costume party right after that cat nap! (Or, should we say shark nap!?) 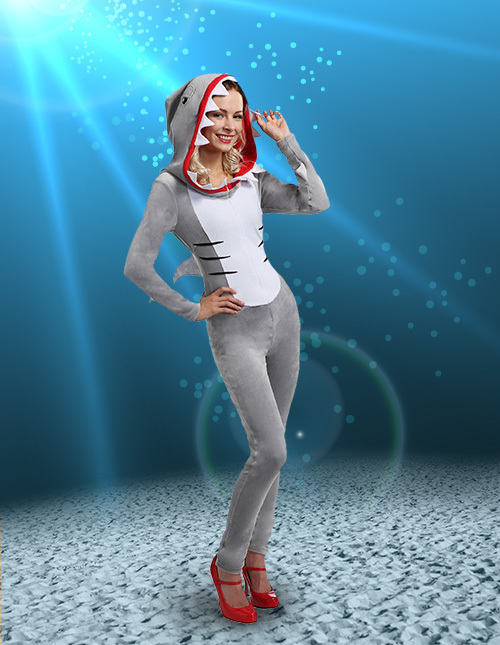 A female shark costume kigurumi is ideal for a soft cuddle, a Shark Week snuggle, or a deep-sea snack because you can wear it anywhere! The only thing we're not totally sure on is how sharks actually sleep, but you're going to love figuring it out. 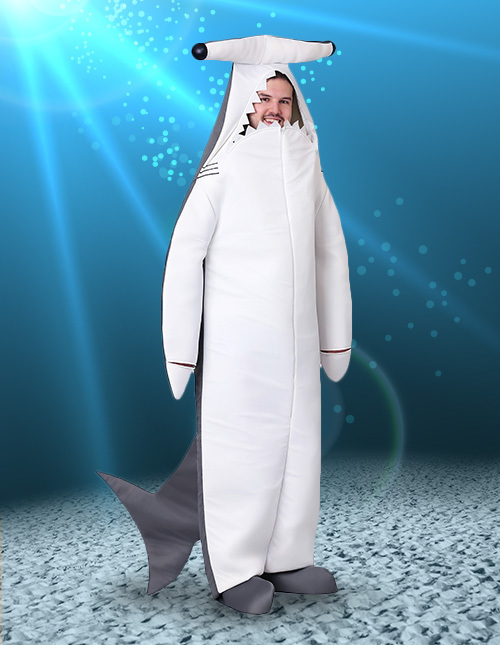 If you love feeling handy around the house but have that longing to expand your horizons from mere plumbing and electric assistance, you dive deep into carpentry with the assistance of one of our hammerhead shark costumes. 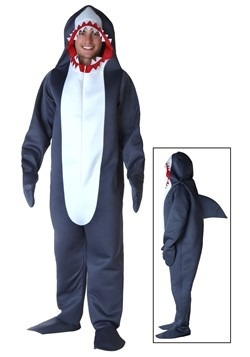 You could get a utility belt to strap around the waist and, because of the sleek design of this deep sea hammerhead, you won't even need to worry about that whole drooping trouser problem common of service uniforms! Of course, you'll have such a unique look to you that fish and friends alike will do a double-take at your double-dose of hammerhead awesomeness! Some predators can be calm and casual about their approach. Others, though, aren't at all shy about revealing their hunter nature. You've heard about the unstoppable swagger of the honey badger? Well, prepare to learn about the shark version of that dauntless smarty-pants! 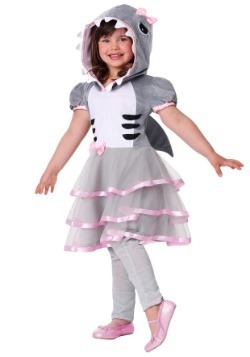 The little-known sassy shark is probably the sleekest of all shark kind! This lithe beauty is capable of moving from deep-sea to low-tide shallows and fits in no matter the environment. Comfortable chilling in the tides or even striding up to social hour, this shark can't be told that sharks don't like roaming about on land! 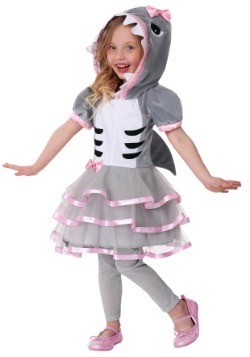 This sassy shark does what she wants! 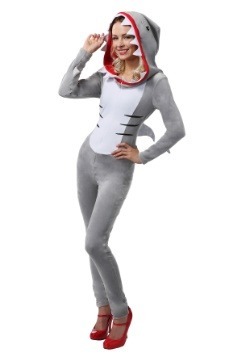 And, well, because she's a shark, most everyone else just goes along for the ride. Now, nobody would look at a little babe and immediately think, "Well, there's an apex predator just waiting to gobble up everything in sight!" But, at the same time, that's sort of just what a little kiddo is! They're voracious little things, hungry all day and ready to wail about it if they don't get what they want. They're just like little animals! At the same time, something about them is just too cute. It actually gives us a bit more insight into why we love Shark Week! 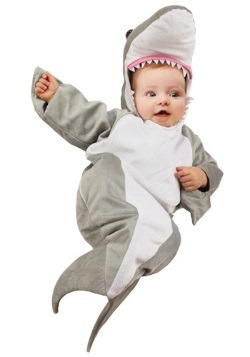 Why not combine the two and turn it into Baby Shark Week instead!? It is a pretty silly nightmare that some parents have: you wake up to see the face of your precious child being swallowed up by a vicious animal. Of course, the other dream seems to pop up, too... the one where your kiddo is transforming into the critter and coming after you! Fortunately, those are all just dreams! You can rest comfortably knowing that your sweetie is the perfect babe they've always been. 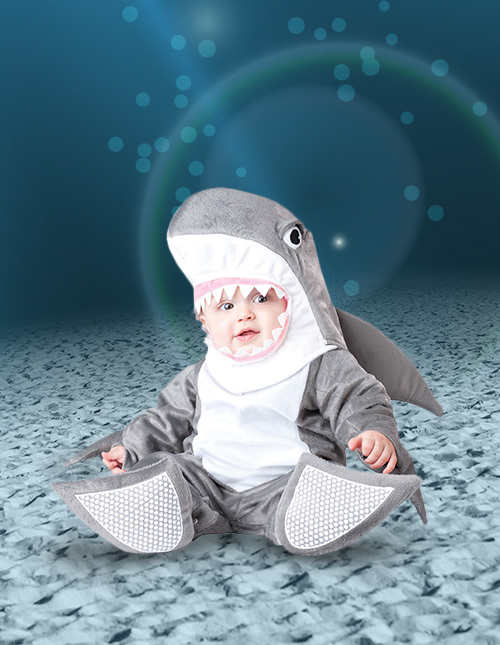 That doesn't mean you can't have a laugh with silly shark look for your tiny tot! It'll certainly help both of you sleep better! 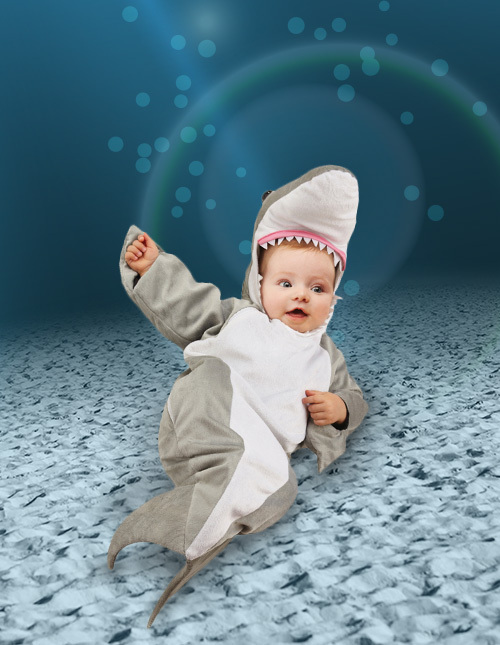 Sharks might be completely amazing, but they don't exactly make for the best parents. Maybe it is the cold blood or the need to keep moving. Monna sharks pretty much find a decent spot to let the litter go and then take off for the deep blue as quickly as they can! 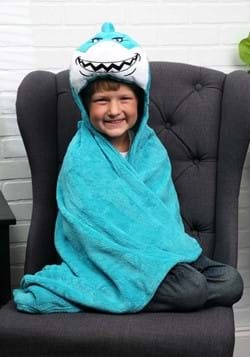 You don't need to let that stop you from loving your own little shark baby, though, and making sure they're all warm, cozy, and bundled up in a snazzy shark bunting is a perfect way to show the world how much you love them both! It's always a tough job trying to control your kids. They seem to get everywhere, even when you are positive that you've been watching them with expert attention. And, if there is water anywhere near them? Well, you can guarantee that they're going to vanish into those waves the second they're allowed to get out of your grip. They practically have gills! 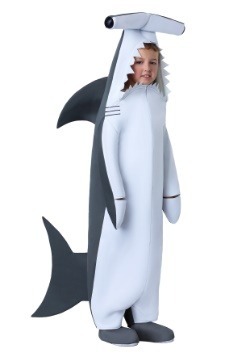 There are ways to compromise, however, and let them feel like little kings and queens of the sea even when they're walking about during the day in a kids shark costume. That's right. 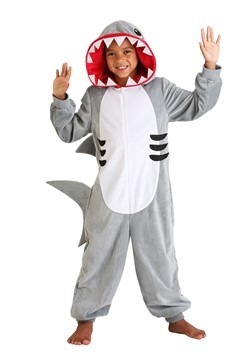 It's time to shark up your tykes and show everyone why they, too, should love the shark. So, your kiddo heard about Sharkboy and Lavagirl and now spends time imagining all about how Planet Drool wants to battle for the salvation of the sea. 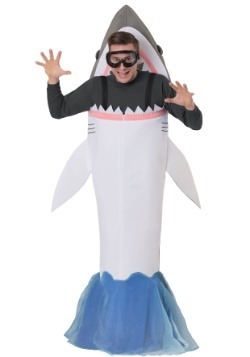 Does he or she want to dive into the water and charge forward with all the mighty power of the great white? Perhaps the tyke has gotten a little bit... bitey? 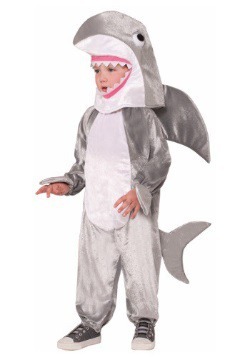 Well, there are ways that you can give your kid the thrill of being a shark boy or girl without all the aggressiveness of the character! 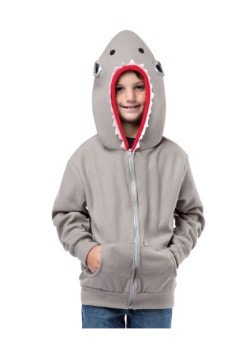 Keep things huggable with a full shark jumpsuit and maybe they can grow into the superhero version. Sometimes our kids just need to feel powerful and a bit scary. There are certainly a ton of options out there, but the great white shark is probably the creature that gives us all the most complicated set of feelings. 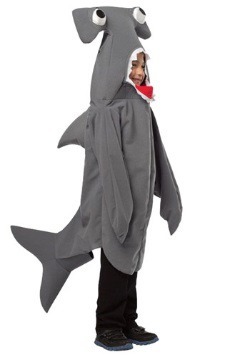 And, when the great white shark can walk on land!? Well, who knew that the critters who've been evolving since the time of the dinosaurs would get such a literal upgrade!? 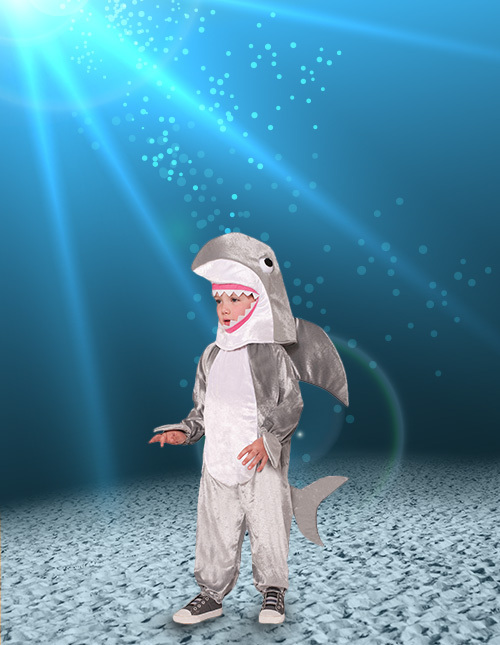 The newest evolution of the great tyke shark is here for fun and your kiddo is going to love creeping around singing, "Dun dun! Dun dun!" Sometimes, you might think your kid is just a little hard-headed. 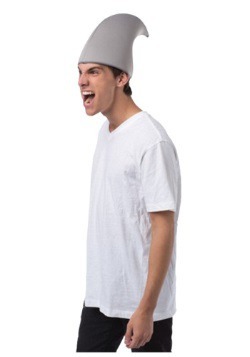 Ever notice that as kids grow, there is often that phase where they seem a little bit snappy. Maybe it is a quick temper or they're a little prone to tantrums? Stubborn as the sea is deep? Perhaps it's all that energy finally bursting out or a hunter's instinct developing that lets them hone in on just what they want and they've just gotta go for it! 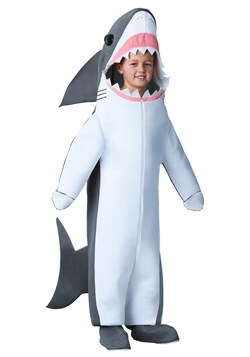 Well, your hard-headed tyke would make a fantastic hammerhead kiddo and the googly eyes might even soften them back up! There's plenty to be said about shark boys and vicious greats and stalkers of the sea, but what about the gentle-hearted sharks that dwell in the shallows? With a creature that is so graceful as it swims through the waters, it makes us think of how great a dancer they must be. Well, who says ballet is just for the swans? 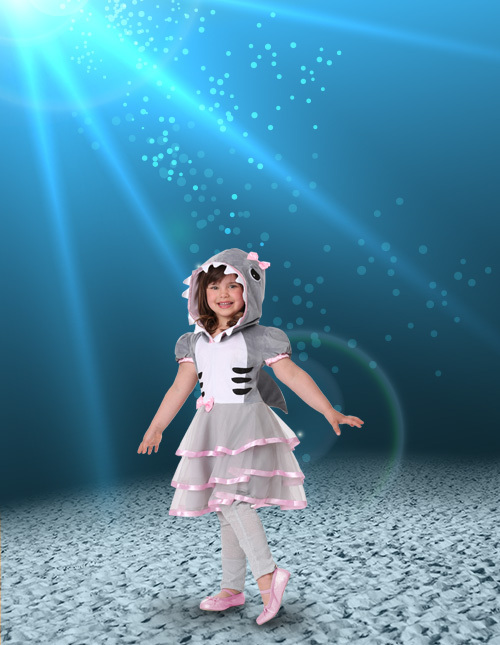 It's time to exchange some of those flippers for flappers and let your kiddo reveal that they are a little shark sweetie! 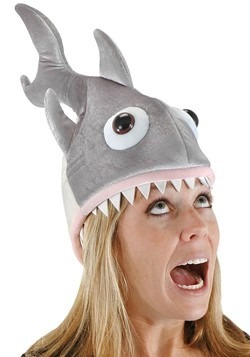 Folks will fin-ally know the grace and style of the lovely shark gal! 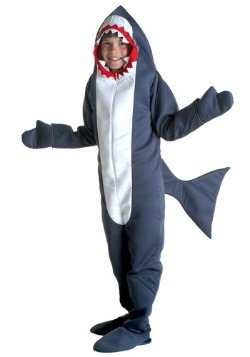 Now, we all understand that sharks are huge, mysterious, frightening, and exciting. We understand that we need to respect the power that these creatures possess and that we should be dealing with them with an equal dose of fear and fascination. That said... there's also something kind of goofy about them. They swim around all day with their giant mouths lolling about and a few of them practically have google-eyes. 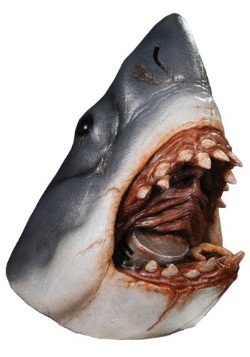 It might be scary to watch them gnaw at a shark cage - which is kind of oppositely named, don't you think? - but it is also pretty ridiculous. 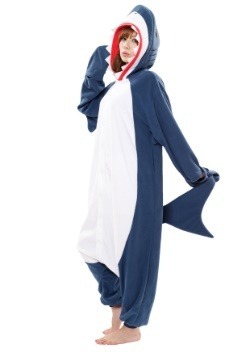 For that reason alone, it is well worth taking a comical approach to the shark. 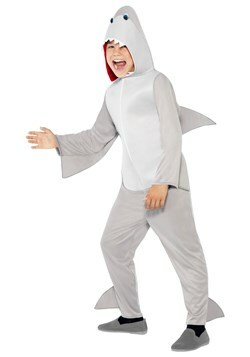 Crack a toothy grin wider than even a shark could with our selections of silly shark costumes. 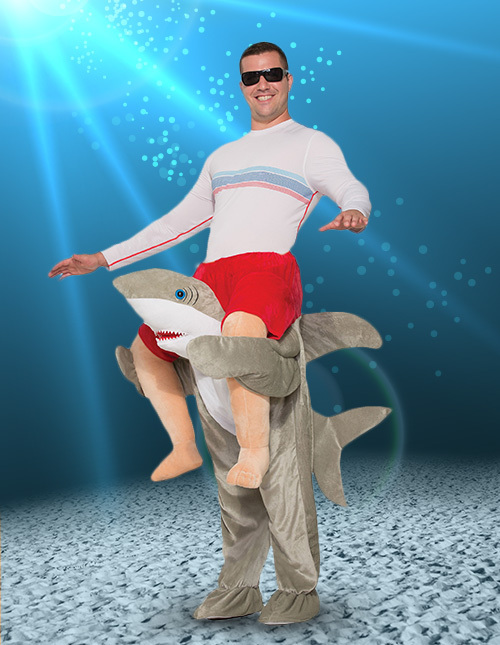 We've all heard about the trope of "jumping the shark." Crazy ideas just to try to keep things fresh don't always go the right direction. Fonzie might have looked pretty ridiculous waterskiing and leaping over a shark, but we think they could have done something even better! 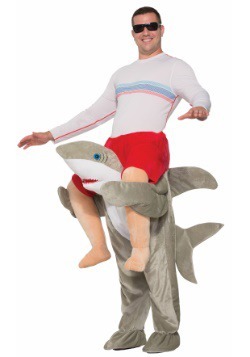 What if the Fonz was getting a "sharkback ride" while the shark was skiing!? That might be hard to manage, but you can at least get a lift from a great white and rest up your legs. 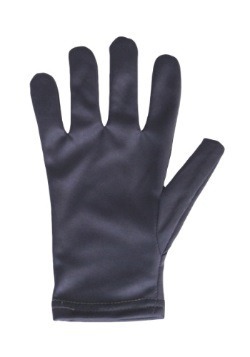 Who knows, add a black leather jacket and you might create a whole new trope! 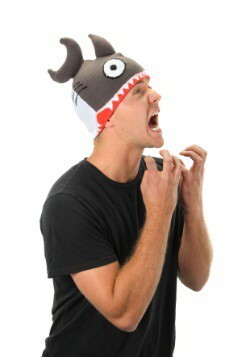 Of course, you know that you need to be careful while running around with your favorite new aquatic friend. It might seem okay with the idea of carrying you from place to place or hanging ten with you while you're riding those waves, but even a shark with the gentlest of demeanors demands respect and the occasional treat. When you fail to provide... well, you're kind of made of noms, too! Watch out for the teeth when you're getting gobbled in a shark attack costume and remember that sometimes you jump the shark and sometimes the shark gets the jump on you! They dwell below us, sneaking below our knees, waiting for their moment to pounce. Perhaps they find the shadows below the dining room table. Maybe they simply wait for our attention to be captured while we walk to the fridge so they can leap up and steal our spot on the couch. They are hunters, through and through. 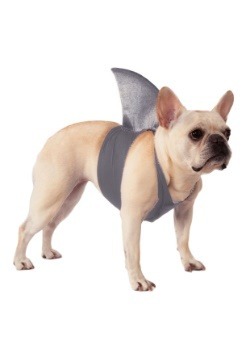 Perhaps these cuddly puppers have been watching Shark Week just as much as we have. They've learned... and they're ready! 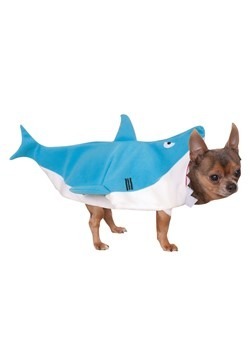 So, since you're going to lose your spot on the couch and give in to treat time anyway, you might as well let your pooch look just like the hungry shark they are with our selections of shark-themed pet costumes! When it is time for snacks, you can just feel your doggo’s snack sense. They know it instinctively as though they can smell the ticking of time. Actually, we're pretty sure they just invent a snack time whenever they feel like it, but it doesn't matter. No matter where they're hidden, no matter where you're hiding, they'll find you! 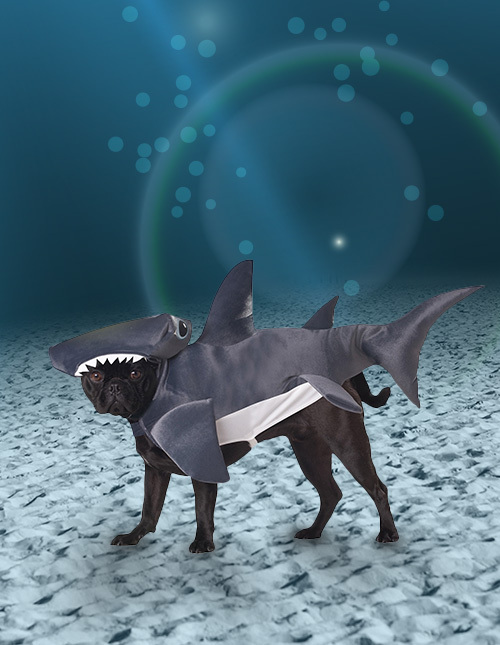 Since they're practically apex predators when it comes to hunting down the treats, you might as well give them a shark upgrade to fit their hunting patterns! 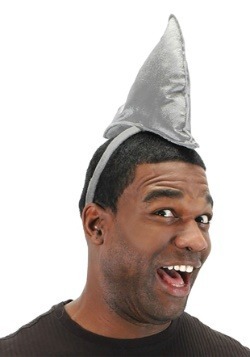 A shark fin is a perfect way to not only show off those instincts but also help you see when they're coming! Perhaps your pup is a full-time guard dog... even though they might lack the size to convince any would-be intruders that they mean business. The size of the dog is measured by the might of their heart, after all. Still, your squat pooch's stature might not match the intimidating prowess that it's pretty sure it has. 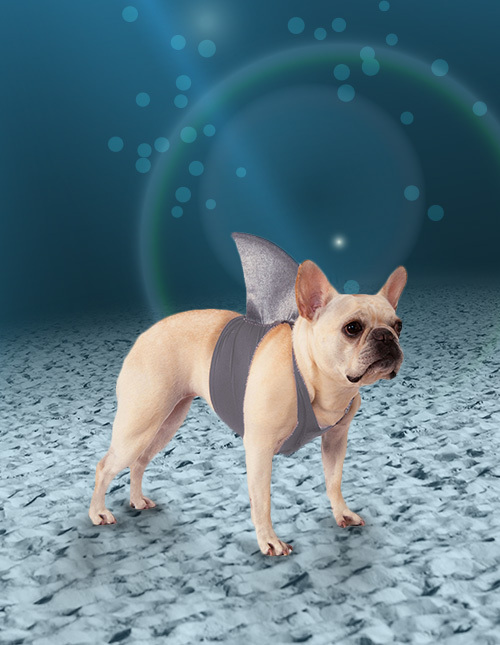 You can give your furball the sleek look of the guardian of the ocean and see what happens when a fuzzy sharkdog meets the world! After all, there's something to be said about a pup that causes intruders to stop in their tracks to snuggle the guardshark, too! 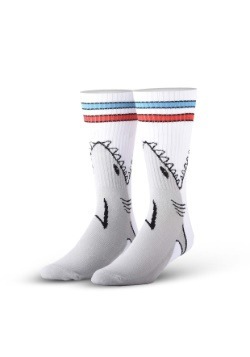 When you've got shark on the mind, there's nothing that can be done to change it. They get in there, live there... leave ideas of little baby sharks that command you to go to YouTube and watch thirty-seven hours of shark streams. It's just your life now. But, there's nothing wrong with that. 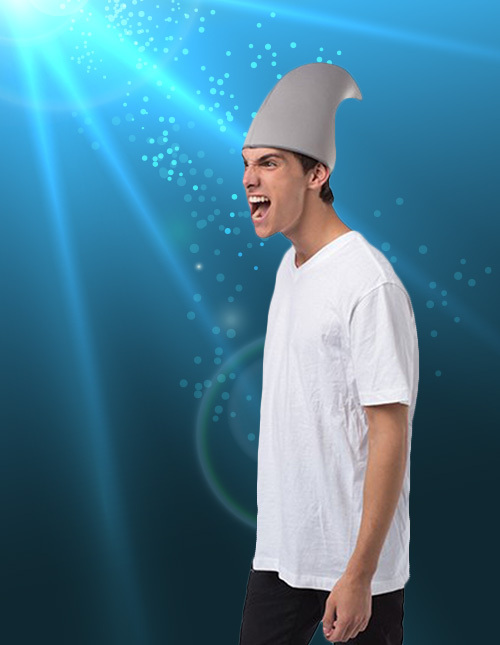 In fact, we think that you should let your love of the fin show for the entire world to see. 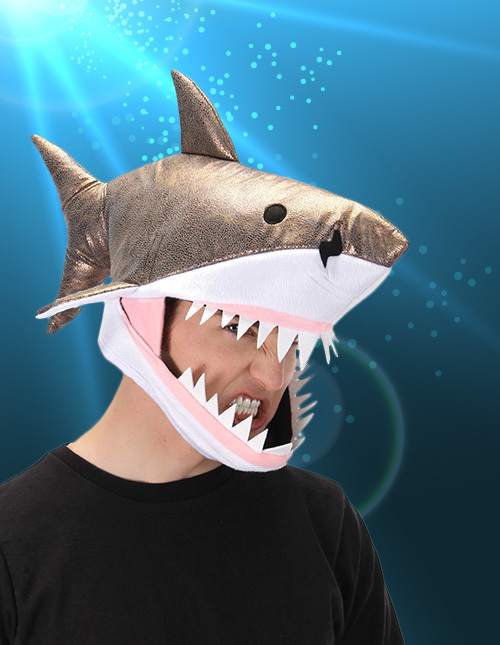 Since there aren't exactly shark flags to fly in your front lawn, the next best option is to wear it straight on your head with some of our entertaining shark-themed hats and Halloween costume shark accessories. It's hard to adapt to some of the more severe storms out there, especially when they are things that you didn't even know were possible. Have you ever heard of a thundersnowstorm? Who knew lightning and ice worked so well together? Of course, the combination of a tornado and a shark school is only slightly more out there... and we've seen like four incarnations of that so far! 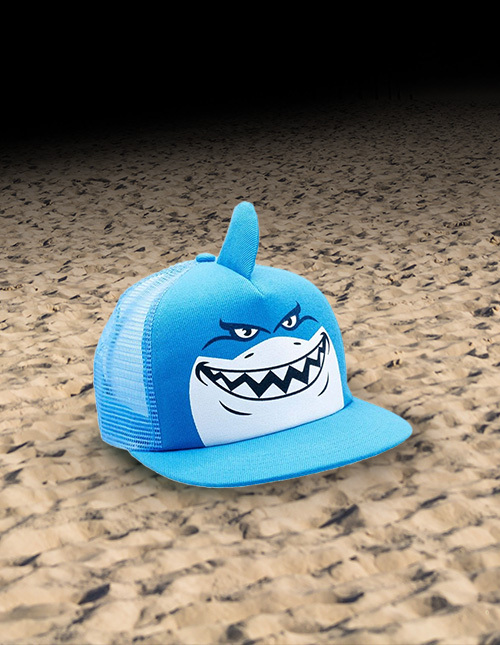 Make sure that you are protected from the falling rain and can camouflage yourself as one of the beasts by wearing a Sharknado fin hat! 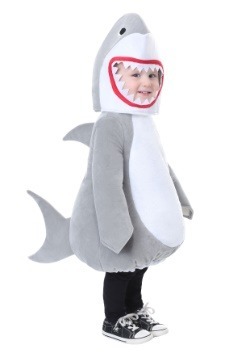 We all know that sharks are both a mystifying and terrifying creature. We watch them with intense interest no matter how big or small they get. However, it is crucial to remember that all sharks can be dangerous... even the little ones that look super soft and cuddly. 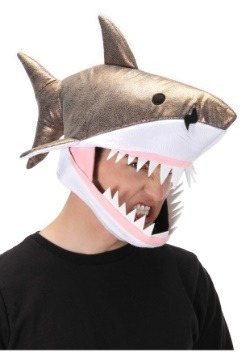 If you're not careful, you could find a miniature great white shark gobbling your face up and leaving you shocked as you walk around wearing the shark like a jawsome hat! Shout out for help as folks see you trapped inside the maw of this mini beast! According to all the animation that we've seen, shark characters tend to have a rather haughty attitude towards lesser sea life. 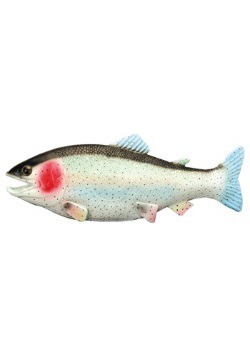 Floundering fish? Food. Outlandish octopi? Ousted. Crabby crustaceans? Cra... well, we don't want to say what happens to them. There's just something about the grim grin of the super shark that leaves the rest of the aquatic area freaking out of their fins! 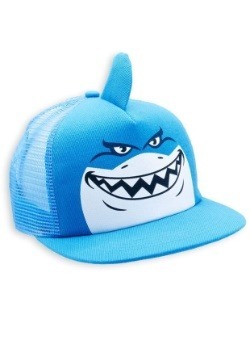 Bring that seaworthy security with you on the land when you smile with a shark cap that shows off your own sharky swagger. Remember: you're the apex predator here! Naturally, when you play too long in the sea, you're bound to come out with a few extra friends. Maybe it's just a few starfish or, (most likely), a strand or two of seaweed. But, on the rare occasion, you might find that a little sea critter has gotten some serious munchies and it's time for a very different sort of dinner time! Fortunately, this deluxe little shark's mouth is way bigger than its stomach, so you're going to be more delighted than you'll be dinner. Still, it might give everyone else a fishy freak-out!